Weed-gate. Free Rocky. Ok I have that out of the way! After a few major hurdles Rocky and Mary Lee Cale hosted another great RC Laser Mid-Winter Championship Regatta at Frank Mackle Park in Marco Island FL. This is one of our RC Laser Class’s longest running regattas, continuing for 14 years. The regatta site is one of the best in the country. The skipper area is about four feet above the pond with a floating dock for launching, and there is a shaded area with tables for lunch, and bleachers for viewing the regatta. Each year this regatta draws skippers from around the country as well as lots of spectators. 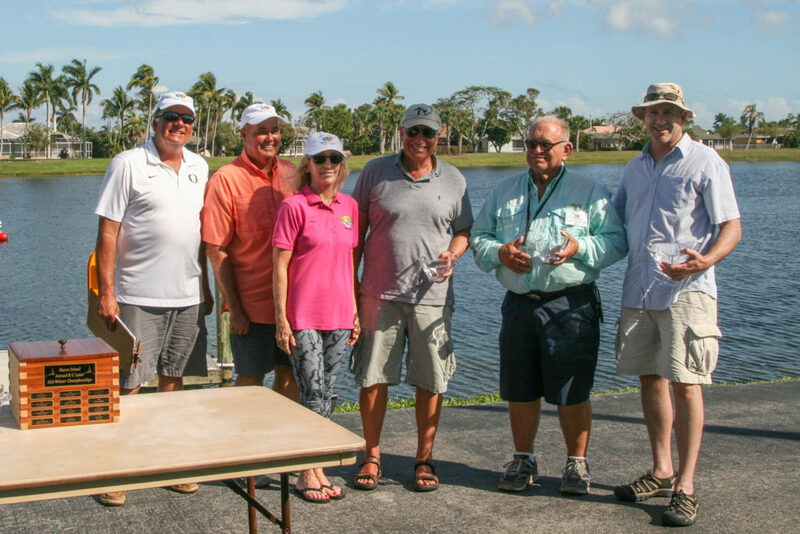 This year 8 time Mid-Winter champion and reigning National Champion, Jim Kaighin from Marsh Harbor, Abacos, won this regatta with 23 points, just holding off his brother, Mike Kaighin, from Sarasota who scored 40 points. Jim won 9 of the 17 races while brother Mike won 5 races. Following in the Gold fleet in third place was David Fine from North Venice winning 3 races and 54 points. Completing the top five were fourth place Henry DeWolf from Palm City FL with 60 points, and fifth place with 68 points Dave Branning from Ocean City NJ. 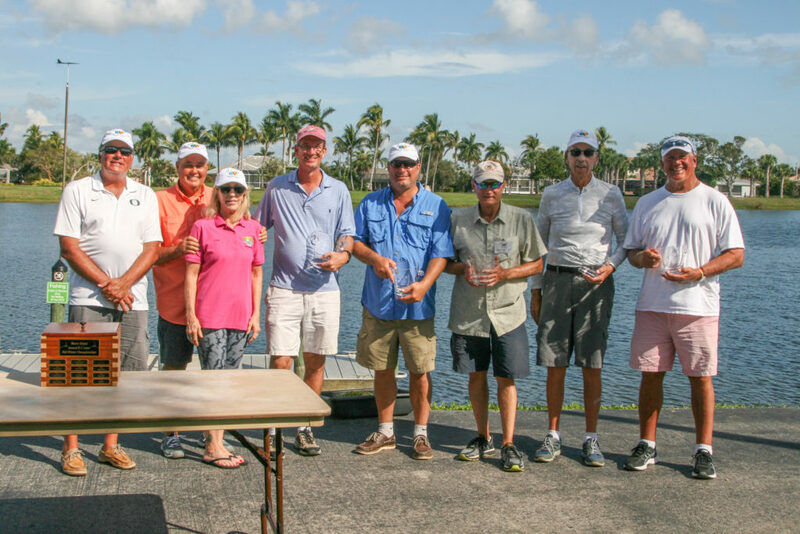 The Silver fleet was won by Jim Flach from Pottstown PA with 32 points followed by Marco Island’s Joel Krissoff with 46, beating out Chuck Weaver from Naples FL by one point. This year in honor of Hank Buchanan, a two-time winner of the Mid-Winters and a long time supporter of the RC Laser Class who passed away last year, a special award from the RC Laser Class went to the winner of the first race in the Gold fleet. This year’s winner was Mike Kaighin. Congratulations to all the RC Laser skippers who attended this year’s event. The Midwinters are always a full weekend of activities and catching up with old friends. Practice races Friday were followed by a dinner at Marco Island Brewery. After Saturday’s racing all the sailors and guests converged on the Marco Island Yacht Club for a fun time and a wonderful dinner with lots of fun, tales and ales! After racing and awards it’s off to Stan’s Idle Hour at the southern end of Marco where we bid farewell until next year – after enjoying the music and cocktails. Having past AMYA President Dave Brawner as RD and his experienced team of Nick Mortgu, Class Secretary, Elaine Hepkin, Lisa Brawner and Beth Lippincott ensured a perfect race recording, and MaryLee Cale as chief scorekeeper (and Beth as math checker) did a quick and efficient job of tallying for the presentation of fine crystal trophies. Hope to see you at the Midwinters next year!